CLEVELAND, Ohio – It should not surprise Breitbart News readers that a Code Pink activist on Thursday night briefly interrupted Donald Trump’s Republican National Convention speech. Only three days ago, Medea Benjamin, co-founder of the infamous Code Pink leftwing antiwar activist group, admitted in an interview with this reporter that her organization will attempt to infiltrate the RNC with the goal of disrupting the event. While Trump was speaking, a Code Pink protester on the second deck of the arena unfurled an anti-war banner as Trump was talking about his foreign policy in the Middle East. People around the protester struggled to get the banner away from her. It took several minutes to eject the protester from the building as she scuffled with other crowd members. 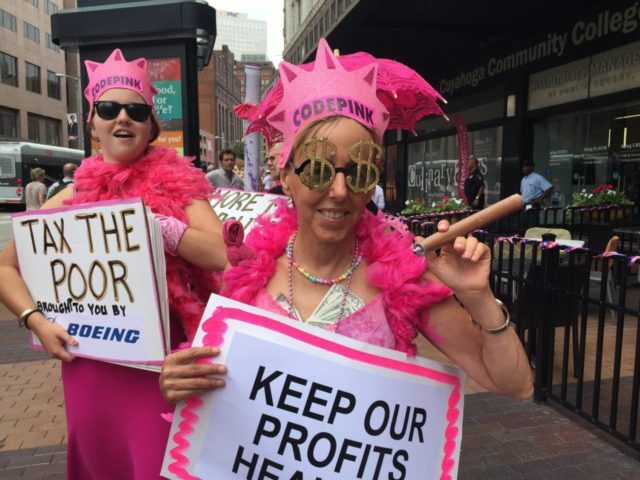 Code Pink has a history of infiltrating and briefly disrupting events, including the confirmation hearing for CIA Director John Brennan; a Senate hearing at which Defense Secretary Chuck Hagel was testifying about the threat posed by the Islamic State; Prime Minister Benjamin Netanyahu’s 2011 address to Congress, and many others.